Aaron's Barges or Aaron's Landing Craft is a relatively young and unexplored wreck surprising all who dive it. 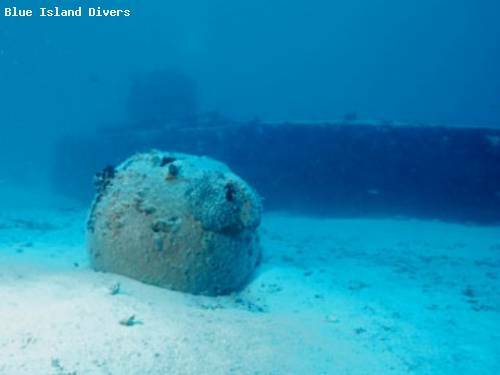 Aaron's Landing Craft was known to some local dive operators who guarded her position, but was re-found by Blue Island Divers on 2nd July 2001 using research combined with the UK Admiralty and the UK Hydrographic Office. Aaron's Landing Craft is an excellent foul-weather-dive due to its location just out of the West Gregory Channel. Here we will always find lea from wind and waves. Our first dive on this wreck found it to be an intact and upright landing craft. The raised fly-bridge and twin open engines are host to a large green moray eel and several lobster. The wreck is circa 50ft long and 20ft on the beam, making this a relatively small wreck. She lies on an otherwise sandy bottom. During a dive on this site, after navigating the wreck itself, it is definitely worth swimming around and away from the wreck as this has lead to finds of old bottles. This shows that the area has not been dived previously, for such artifacts to be remaining. The sand around the site is also home to many southern stingrays and garden eels.